Kevin Mulhern has enjoyed a career writing for television, radio, newspapers, and magazines, and was guided early in his career by his dearly missed, beloved mentor and friend, the comedic actor/writer, Phil Hartman. Kevin is currently a radio producer and on-air talent at 94 WHJY in Providence, Rhode Island. Prior to that, he was a professional youth counselor for behaviorally-challenged children at Harmony Hill School in Rhode Island. He has also worked with youth as a volunteer mentor at the San Miguel School in Rhode Island, and volunteered as an academic tutor to homeless teens and adults at Crossroads Rhode Island to help them earn their GED's. Additionally, he taught Religious Education to elementary school students at St. Philip Church in Rhode Island. To Jenni, my ray of sunshine on many a cloudy day. To my parents, Tom and Barbara, and brother, Brian, for always believing that, someday, I could “make it rain.” And to Liam, who I know was born to make this world a better place. 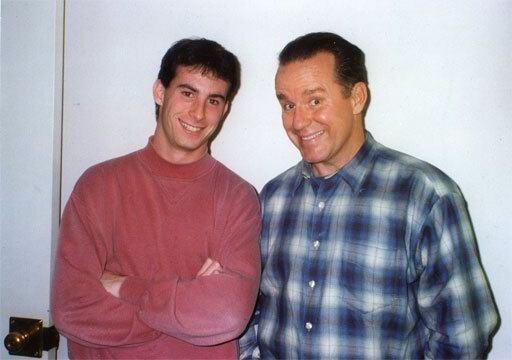 Kevin with his mentor and friend, Phil Hartman, in Phil's dressing room at "Saturday Night Live" in December, 1993. Rest in peace, Phil, and thank you for everything! (And I apologize for my "hairstyle" and wardrobe choice in this photo, and thank Phil for not turning me into a zany "SNL" character with a bad wig and hideously-colored pink turtleneck sweatshirt). Be sure to read the fantastic biography about Phil, You Might Remember Me: The Life and Times of Phil Hartman, by the amazing author, Mike Thomas. Kevin and his brother/writing partner, Brian, were honored to contribute to the book and share their anecdotes about Phil and about their creative collaboration with him, as well as their unforgettable personal relationship with such a brilliant performer and amazingly generous and loving human being. He was "the boy" to Kevin's "Cody" - always encouraging him in his career and life. Without Phil, this book never may have happened. If you would like to partner with us for a fundraising book reading and signing of CODY THE CLOUD, fill out the form below and we will get back to you. Thank you for your interest in "Cody The Cloud!" We will be in touch with you shortly!